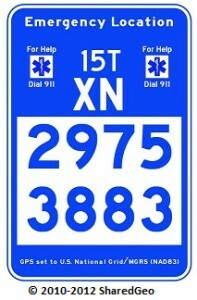 As USNG Emergency Location Markers (ELMs) become increasingly prevalent on northern Minnesota trails, there has been an outpouring of support from the snowmobiling, cross-country skiing, and other outdoor recreational communities along with emergency responders. But no one is as fervent of a supporter of the USNG ELMs as Lake County Emergency Manager, BJ Kohlstedt. Ms. Kohlstedt was first introduced to the USNG ELMs when she was approached by SharedGeo Executive Director Steve Swazee and Technical Director Bob Basques in 2010 to partner in their OPERA grant-funded pilot program for the ELMs. Having been asked by the local snowmobile club to install location markers along trails in the area, Ms. Kohlstedt and Lake County accepted the offer to partner with SharedGeo. In October 2010, representatives from Lake, Cook, and St. Louis counties, the Department of Natural Resources, and the US Forest Service—among others—met with SharedGeo to design a recreational sign that could be both universal and consistent with state and federal signage regulations. Since then, the ELMs have been “spreading like mad to other counties and other states,” said Kohlstedt, and she has been working tirelessly to promote public awareness of the signs throughout her area. Kohlstedt, along with other Lake County emergency workers, has spearheaded the creation of free USNG guides and brochures showing the locations of the signs on the trails, and made them available at bars and restaurants along the trails. Local bars also ask for their own USNG signs with their coordinates to be made, to display for their patrons.